KOKOMO, Ind. – When sports teams have successful seasons, they can usually look back to a defining moment. Last season, the Indiana University Kokomo volleyball team defeated Point Park University 3-2 for the programs first-ever win over a ranked opponent, and in the process improve to 5-0 in its record-breaking season. This year, the squads defining moment may have come in a straight-set, dominating victory over IU East to earn its fifth win in six matches after starting the season 0-5. The 25-15, 25-16, 25-22 victory was so defining, it was actually historic: it marked the first time the Red Wolves of IU East had ever lost to an IU regional campus team. It also snapped a five-year streak of IU East winning its first Kentucky Intercollegiate Athletic Conference game of the season. While many would consider this an upset win, IU East (3-7) is having a down year despite an earlier season win over the Cougars. What a difference a couple of weeks makes. After a straight-set loss to IU East on Aug. 23, the Cougars played like the better team in the second meeting of 2014. Playing in front of a packed Cougar Gym on Military and First Responders Appreciation Night – which happened to fall on Patriot Day – IU Kokomo found itself down 3-2. But an error by IUE followed by back-to-back kills from Keeana Walton (Peru, Ind./Maconaquah) and Lexi Brickner (Wabash, Ind./Southwood) put the Cougars up 6-3. By the time Lindi Thomas (Parker City, Ind./Wapahani) scorched the Red Wolves defense with a pair of kills, the Cougars were up by eight points and cruising to the first set win. The second set was much like the first. IUK trailed 1-0, but then dominated for the easy nine-point win. The third set turned into a thriller with seven ties and a down-to-the-wire finish. Tied at 12, Kokomo looked to be slowly pulling away at 14-12, 16-14 and 18-14. A service ace by the Red Hawks cut the lead to 20-19. Casey Colgate (Indianapolis/Lutheran) blasted one over the net to give the Cougars a 23-19 lead, which was short-lived as the Hawks closed the gap once again, cutting the lead to 23-22 on a Kokomo error. Following a Cougars time out, Walton scored on a kill and Natalie Heaton (Muncie, Ind./Wes-Del) closed the door with an ace to give the Cougars its first KIAC win of 2014. Micayla Speidel (Columbus, Ind./Columbus East) and Thomas led Kokomo with nine kills each, Elyse Younger (Fishers, Ind./Fishers) had seven kills and Brickner finished with six. Cortney Hanson (Logansport, Ind./Pioneer) had 21 sets with Colgate adding 15. Lael Larrick (Denver, Ind./North Miami) led the squad with 14 digs on a night when Kokomo had just five errors. Several military veterans and first responders were on hand to be honored as heroes by the Cougar Gym crowd. Following the game, they posed for pictures with the victorious team. 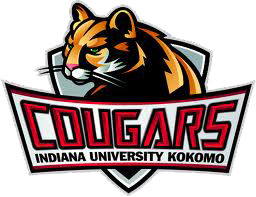 IU Kokomo (5-6, 1-0) returns to Cougar Gym on Sept. 13 for a tri-match against Asbury University and Calumet College of St. Joseph. The Cougars play Asbury at 1 p.m., Asbury and Calumet battle at 3 p.m., and IUK returns to the floor at 5 p.m. to host Calumet.